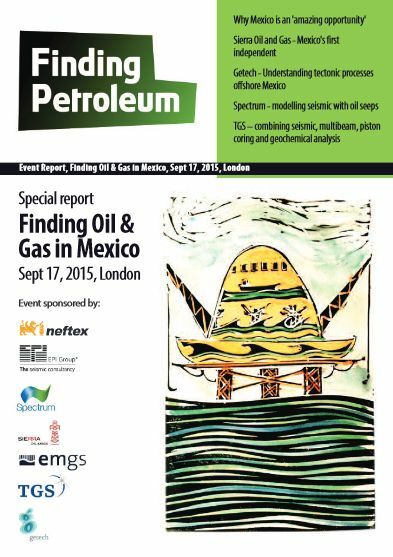 Mexico is an exciting country in world exploration and production at the moment, following Mexico making changes to its law last year allowing private investment in its oil fields, ending a 76 year monopoly given to PEMEX and allowing IOCs - Majors, Independents, Start-ups - to become involved. If you click on this link to Sierra Oil & Gas, you will see the range of opportunities nicely illustrated. These opportunities are what we would like to hear about: please contact me if you/your company would like to make a presentation. And Richard Mcintyre if you are interested in the sponsorship/exhibiting opportunities we offer. Mexico auctioned two of 14 blocks in the pivotal Round One oil and gas tender on 15th July. Both the shallow water exploration and production contracts were awarded to the same consortium made up of Mexico's Sierra Oil & Gas, U.S. firm Talos Energy and Britain's Premier Oil. 4. models that suggest more complex relations with Caribbean subduction and ocean spreading (e.g. Dutch, 2009). These models require different driving forces and modes of opening for the Gulf of Mexico, and lead to different types of margin formation across the various segments of the Gulf of Mexico. These differences affect the history, geometry and volume of accommodation space for source rocks, seals and reservoirs, with associated impacts on ocean circulation, source to sink relations and depositional systems. Subsequent deformation phases, such as the Laramide Orogeny across Mexico, can also be represented in each plate model’s global context. Such events have a great influence on fault reactivation and, consequently, on fluid migration and trap formation. In this talk we present a refined tectonic plate model that details the tectonic evolution of the Gulf of Mexico and highlights the impact of existing models on the development of petroleum systems. Our model is based on the interpretation of gravity and magnetic data offshore, Landsat and SRTM onshore, and public-domain data; these data were used to create a 1:1,000,000 scale structural map and also provided the foundation for building a detailed understanding of the area’s crustal types and crustal architecture. These form the foundations for a regional plate model which is constrained further by placing it into the context of a global plate model to understand the consequences on the greater global plate circuit. With acknowledgement to Getech’s Peter Webb, Nicola Henshaw, Benjamin Franklin (now at ENI UK Ltd), Samuel Cheyney. Following a PhD and Postdoc on Indonesian geology with the SE Asia Research Group at Royal Holloway (2001-2006), Helen joined CASP (formerly Cambridge Arctic Shelf Project). At her time at CASP (2007-2013) Helen worked in a variety of Arctic projects, and successfully led research programmes in the Canadian Arctic and Barents Shelf. Helen joined Neftex in 2014 as part of a team working on an array of short-to-medium term regional-scale geology projects. During 2015 she has worked as a geoscientist on the Gulf of Mexico, with a focus on the Mexican Burgos and Sabinas basins. Helen’s research interests include sediment provenance, sedimentation in volcanic settings and the regional geology of Indonesia and the Canadian Arctic. Helen is treasurer of the Petroleum Group Committee of the Geological Society of London and has served on the committee since 2010. Helen has a BSc in Geology from Queens University of Belfast (2001). UK Trade & Investment (UKTI) works with UK based businesses to ensure their success in international markets through exports. We encourage and support overseas companies to look at the UK as the best place to set up or expand their business. UKTI is a non-ministerial department. EMGS is a Norwegian, leading market share Geophysical company focused on the acquisition, processing, inversion and interpretation of 3D marine controlled source electro-magnetic (CSEM) data. To date that they have acquired over 850 commercial surveys worldwide and have over 110,000 km sq of 3D multi-client data covering many of the world's petroleum basins. The company has developed methods and tools to enable clients to integrate CSEM data into existing seismic and other geophysical datasets. When applied systematically across a CSEM sensitive portfolio. The new information provided by CSEM has the effect of polarizing existing evaluations, making CSEM a valuable tool in exploration venture evaluation. EMGS work in frontier regions and mature basins, from the Arctic to southeast Asia, and from offices across the world.